Hey guys, brand new user here. Is there any way to improve the performance besides turning the settings down? I run FNV on the ultra preset (1080p + vsync), and my performance in the base game is significantly greater than that of TTW's. In the base game I maintain an average of roughly 80 FPS with drops to 60 during graphically intense moments (i.e. gunfights). However, in TTW, I find myself constantly dropping down to 30 FPS from the ordinary 70 or 80. I watched Gamer Poet's video on the performance mods for FNV and have installed them properly whilst tweaking them with the helpful FAQ on this site. It's not really a major problem, but it gets quite bothersome at times when I don't notice these drops in the vanilla game. Perhaps it is simply the generated LOD? Any suggestions and setting recommendations would be much appreciated. I run the game in SLI by the way, and seem to get around 5-10 FPS more with it enabled. Also have the game stored on a 3TD HDD, not an SSD. I'm working on improving performance. It's heavy having two entire games and DLC, plus yes the object LOD is a tad heavier but shouldn't make much notice. I did test some areas like Point Lookout in Fallout 3 vanilla and the frame rate was pretty bad there too. My machine is no slouch, 1080ti+i4790k etc. I just have to optimize the worldspaces, the lighting engine changes seem to be the most change or something else with how havok or rendering is handled in DC. In Vegas I maintain the stable framerate I get in vanilla. Fallout 3 is just more complex I think. Correct me if I'm wrong, but didn't Fallout 3 have these things called Static Collections? It appeared, from reading the GECK article, that it's a form of runtime static batching, where statics are grouped into one 3D model, thus reducing the draw calls. 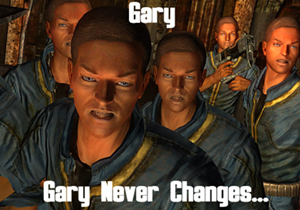 That functionality was removed from New Vegas for one reason or another. Supposing that the static collections were treated as a single model, and not just a convenience thing that treated multiple game objects as a single one (NOT the same as combining 3D models! ), that would offer potentially large reductions in draw calls. New Vegas still has and uses quite many static collections and you can create them in GECK, I have done so when working on optimizing Point Lookout. It requires more work than that though to remove unseen faces, merge the havok together and remove useless collision bodies, welding everything, fixing the normals and a lot of other work. Optimizing is time consuming and a lot of work to do correctly so it's low on my to do list, however I will get to it. Part of the problems are just badly optimized meshes in Fallout 3, which I address over time. There's endless things to fix/optimize in this game. I imagine that with the capabilities of NVSE and JIP there's room for vanilla scripts to be made much more efficient. Hell, we have event handlers now. I'll be going to America for a weeks on the 21st, so I won't be of much use stuck in the middle of nowhere without any internet. But after, I'm game for helping out with optimizing things. Got a pretty good grasp on 3DS Max, xEdit scripting, FNV scripting, and using the GECK, so if you want another goon to slog through it all, I'm game. Edit: Another way performance could be greatly optimized, would be to create texture atlases out of the textures that use the same materials. But that would also involve modifying the UV's for the involved meshes. I talked about this with Sheson ages back, and he said there was merit to the idea. Only problem is that it would require someone like him or Zilav, with the knowhow, to create a tool to facilitate creating atlases. The atlases alone would reduce driver overhead a great deal, and with more meshes sharing the same texture, there would be more opportunities to batch the game's objects into static collections, reducing draw calls directly. Unfortunately doing atlases (and scols) creates incompatibilities I'm not willing to enforce on people. There's some exception to this, PL desperately needs help on the dock, so I will do it, but it's likely I will make this a mod as this will make modding the area more difficult. I'm hoping I can optimize badly done meshes. Jamilla has also discovered that sometimes just re-exporting stuff fixes issues, there was a few rubble piles with such problems. Thanks for the response Roy! Do you have any temporary suggestions in the mean time for improving performance? FPS is mostly bad when in larger fights such as during Operation Anchorage in the trenches, or in Big Town. I adore your work and thank you very much for any support that can be given. One performance tweak that I know of, is to set the muzzle flash light's radius to 0, preventing the light from being rendered. The benefit will only be found in gunfights, but doing that saved my Phenom II CPU when I first played TTW.